Lava Zone 2. Water Catchment System required for homes. SSPP has not been paid and is approximately $2467 according to recent update from HELCO. Interior Features Beautiful lot located on Trade Wind between Kona Drive and Coral Parkway. Elevated for good views! Nice Ohia trees on property. 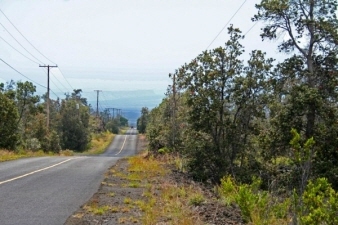 Exterior Features Approximately 103' X 419' one acre parcel. Property is located in lower 1/3 of subdivision! Near shopping in Ocean View, Hawaii. Wonderful small rural community with two grocery stores, gas stations, hardware store, laundry mat, restaurants, post office and other businesses in area. Additional Features and Amenities Excellent location on Southwest side of island with affordable prices! Paved roads, community park in subdivision, new community well (not piped to homes), and community center for subdivision.